What is Wake up and run exactly? 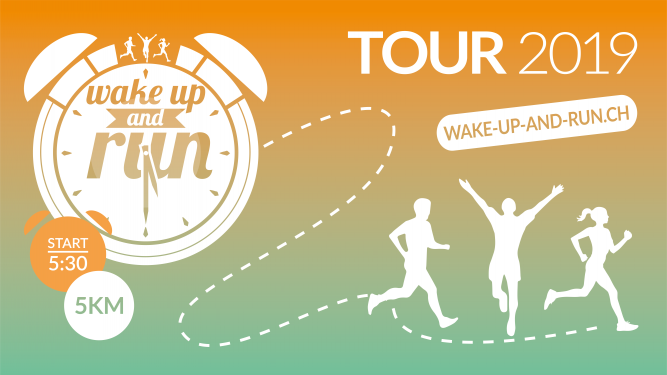 Wake up and run is a non-timed 5 km running that takes place at 5:30 a.m. in the center of 11 Swiss cities and which is followed up by a take away breakfast including regional products. By taking part in a Wake up and run event, you have the opportunity to run or walk with your friends, your col-leagues, your family and to discover your city still asleep from a very particular perspective. - Appointment on the Place du Port on Friday morning May, 17th 2019 at 5:20 a.m. for an animation and a warm-up offered by our partner QoQa. Start of the race at 5:30 a.m.
- Shuttle buses will bring you back to changing rooms after the run from Place du Port towards la Mal-adière at 6:15 a.m., 06:30 a.m., 6:45 a.m. and 7:00 a.m.
Pets are not admitted on the course.